The video booth is similar to our standard photo booth, yet it’s very different. 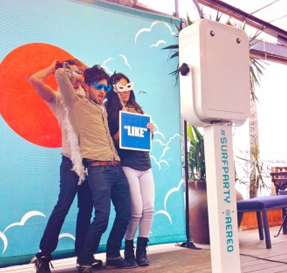 It has the same set up and style as the photo booth except you don’t take pictures – you record videos. 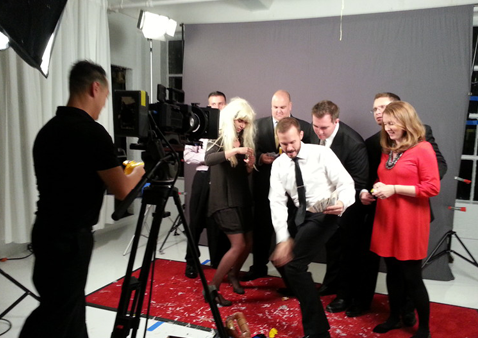 And these videos turn into a digital, in-action scrapbook for the hosts and guests of the event. Everyone has the spotlight. Guests leave private and intimate messages, speeches, songs, shoutouts or thank yous to their dear hosts. The seclusion of the booth allows you to express your feelings and say what you really want to say to the bride and groom, sweet-sixteen birthday girl or bar mitzvah boy without an audience’s eye fixed on you. You have the option of recording a 30-second, one-minute or two-minute video message. The countdown shows on the screen so you know when it’s ending. But if you must give a really long, heart-felt speech and two minutes is just too short for you, you can record a second or even third message right after your timer ends. 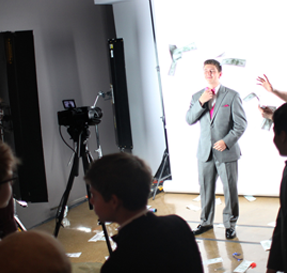 Similar to the classic photo booth, guests enter the video booth with props in hand or maybe even confetti or party horns hidden for a surprise bang at the finale of the video message. With a touch-screen pad in front of them, they select to record a 30-second, one-minute or two-minute video message. They then select start and the unit begins recording with the time remaining shown in the corner. The hosts can choose to have the personal video messages edited into a DVD or Blu-ray, or they can choose to have the unedited footage sent to them. The DVDs or Blu-rays make for the perfect party favors to be sent out to family members or friends.